A diverse group of travelers came together in Old Town Scottsdale braving threatening rain and unseasonably cold weather to experience "A Taste of Old Town Scottsdale" offered by Arizona Food Tours. Our young, enthusiastic guide, Jason Sealy, started the tour by asking who in the group had been on a food tour. Only two of the twelve participants had experienced this type of excursion. With high expectations, we began our three hour food adventure at 11:00am in front of the Scottsdale Historical Museum, a tourist stop not to be missed. After a brief synopsis of the city's early history, we began our two mile walking circuit of six diverse restaurants. 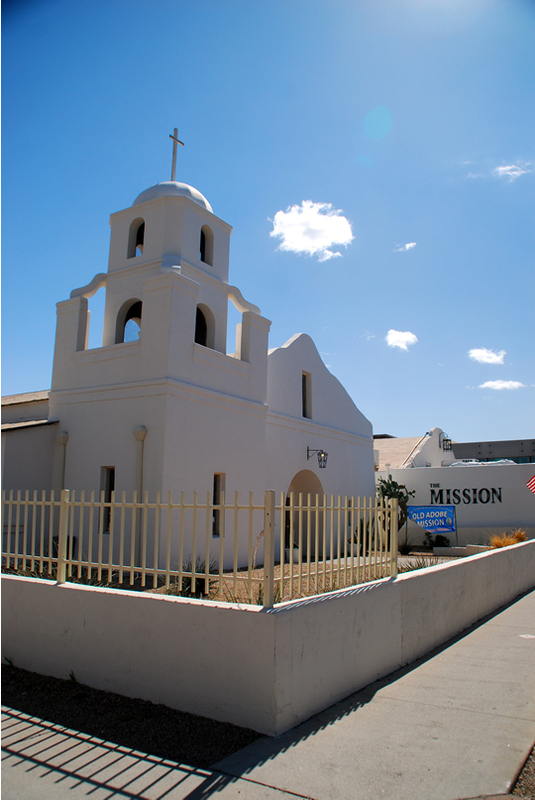 Our first stop was The Mission, located in Scottsdale's first Catholic church. Mac Carter, the chef and local culinary star, created a tapas style menu for us to sample. Pineapple salsa, homemade corn chips, mini pork shoulder tacos and a mango margarita was our light, first tasting. The group spent twenty minutes getting to know each other and sampling Scottsdale's version of southwest fusion cuisine at a comfortable communal table. Just enough food to help our group bond. After a ten minute walk, we arrived at our second destination, the Union Barrelhouse, Scottsdale's first craft beer restaurant. Here, I chatted with Eric Peck, its general manager. Mr. Peck shared the restaurant had been opened less than a year but had become one of Old Town's must-see bars. Weekly, he receives specialty beers from all over the world for his customers to sample. Sweet beers, spicy beers, fruity beers, dark lagers, ales and stouts are all served from a tap. Once the keg is empty, a new beer variety replaces it. The "craft beer" concept has really caught on with other new establishments like this one opening up all over Scottsdale. "People love this restaurant concept," was his comment. We were given a menu of six different beers from which to choose. I selected a UB American Hefeweizen, a sweet beer brewed in Phoenix. To compliment our beer we were served a caprese sandwich with chicken and a side dish of smokey mac and cheese- both delicious and once again, just filling enough so we still had an appetite for the remaining four eateries. Our next stop was Malee’s Thai on Main located in the heart of Old Town's art and cultural district. For over thirty years this restaurant has been dishing up superior Thai food for locals and tourists alike. We were served Tom Ka Gai, Malee's world famous sweet and sour soup, made with coconut milk, chicken, mushrooms and cilantro; (which was to die for) and fried spring rolls stuffed with egg, carrot and bean vermicelli. Thai cuisine with a hint of southwest favors makes for an interesting food combination and is one of the primary reasons this restaurant is so popular. For my beverage, I opted for green tea instead of rice wine. 5th and Wine was next on the tour. By this time, I had visited with most of my fellow travelers and found out we had a highly diverse group. Engineers from Canada, a doctor who worked at Yale and his family, a lawyer from New York and his new bride, two women retirees from Washington DC and two Southerners from Louisiana, my husband, Pete, and me. Their ages ranged from early 20's to late 60's. 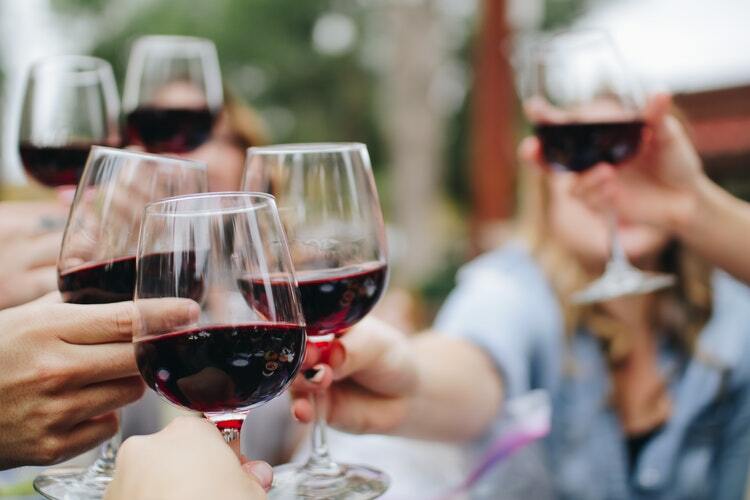 By the time we had arrived at 5th and Wine, the group had loosened up and had begun to really enjoy the wonderful food and each others' interesting company. Good food and drink, truly, is an universal pleasure and a conduit for friendship and memorable times. Instead of wine as we expected, 5th and Wine offered us a white apple or red pomegranate sangria to sample. I went for the pomegranate, a favorite fruit of mine, but ended up switching with my husband because the apple sangria was, surprisingly, fabulous. I had never heard of "white sangria" but, trust me, it was much tastier than the traditional red variety. A Bruschetta platter of six different choices was presented. Hummus, roasted peppers, prosciutto, tomato, sautéed wild mushrooms and apple were the samples served along with a side platter of fried pickles, a Scottsdale favorite. All of the selections were delectable. By this time, we were getting extremely full and a little tipsy. The group lingered here, all having a "grand ole time." I found myself giving the doctor from Yale and his wife travel tips about visiting Russia! Everyone's conversations were beginning to be quite random and entertaining. Laughter was occurring at all of our tables. *Update: Unfortunately, 5th and Wine is no longer open for business. Check out one of these hip wine bars instead! Hating to leave 5th and Wine, next we headed to Cowboy Ciao. Here, the coterie enjoyed a beet and buckwheat salad which didn't sound like something I would like but I sampled it nevertheless. To my surprise, it was flavorful and different. Roasted beets, butternut squash tossed with cracked buckwheat on Belgian endive with chèvre and walnuts was the description of this dish. "Modern American" cuisine is how Cowboy Ciao labels its food. Some of its other interesting dishes were Espresso-Rubbed Elk, Bison Meatloaf, Cast Iron Lamb Sirloin and Pastrami-Style Smoked Short Ribs. The cocktail menu offered quirky drinks such as Welcome to Iceland, When in Buffalo Roam, Crouching Bulldog and Repo Man. Like many cult establishments, it even had a souvenir counter where one could purchase specialty t-shirts, jazz cd's and a "super chuck" popcorn treat. "Way out," western food and fun is how I would characterize this unique place. Update: Cowboy Ciao is no longer open for business, but evidently, you can get a version of their famous chopped salad at Citizen Public House. We ended our food extravaganza at Super Chunk Sweets and Treats, a confectionary known for baking the "best" cookies in Scottsdale. Cookie bags filled with chocolate, chill pepper and peanut butter, chocolate chip cookies (both addictive) were distributed for dessert as the final course of the tour. This tour would be ideal for a solo traveler. "...Travel through time to some of the same streets that have been stomped on by the cowboys of the early 1900"s frontier. We will guide you through Old Town Scottsdale from past to present and discover how it has grown throughout the years and why it is still today one of the most popular, and tasty, tourist destinations in the US," is how the company describes its tours. This statement is spot on. The historic commentary, the variety of food and beverages and the interesting travelers made my first food tour a memorable one. I went on this excursion with my husband, but I would highly recommend "A Taste of Old Town Scottsdale," to the solo traveler visiting Scottsdale. Not only is it a lot of fun, but you get to sample some of Scottsdale’s best food and make some new foodie friends!